The Scones will be performing live for their CD Release Party celebrating the release of their new album "Metrognomes" in The Radio Room at KAFM Community Radio on Thursday, December 20th. The Scones are known for their Rockin' & Rollin' Americana music incorporating big vocals, guitar gymnastics, banjo, bass, percussion, drums, and flute. They deliver high energy performance and infectious groovy harmonies. You won't want to miss The Scones! The doors open at 7 p.m. and the concert will begin at 7:30 p.m. Proceeds from concert to benefit Salvation Army. Local Rock. 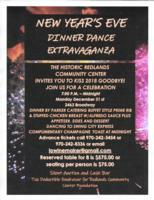 Historic Redlands Community Center New Year's Eve dinner dance. Table for 8 $575, per person seating $75. Complimentary Champagne toast at more...0 midnight. 9:00pm-1:00am, Baron's GJ, 539 Colorado Ave.
Gina D'licious is hosting the Baron's New Years Eve Party. Drink specials, Ball Drop, Performances and MORE!! !